As all major cities around the world today are witnessing an unprecedented growth in the urban population, it has become imperative to consider building and re-designing existing food networks that are resilient and sustainable to cater to the demands. As an outcome of this, interest in local farming has witnessed a rapid growth over the last two decades. Several alternative urban and peri-urban food production systems have taken shape to enhance the expanse of local food systems of cities. These local food projects need to cope with uncertainties such as sudden spike in demand and change in climatic conditions. Since these initiatives form a part of the local food network, their ability to be more resilient to these uncertainties tend to increase the understanding of how the local food system could work towards becoming more resilient. Therefore, it is important to understand what attributes of local food initiatives make them more resilient. 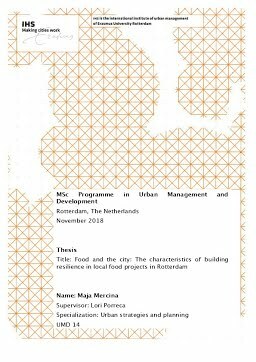 This study aims to articulate the conditions under which urban food projects in and around the city of Rotterdam (the Netherlands) tend to be more resilient and outlines the dynamics of relations between the actors involved under the city's current governance structure. The five urban food projects chosen for this study were Voedseltuin (a community garden), Volkstuinvereniging Lusthof (allotment gardens for amateur gardening enthusiasts), Natuurluck (small-scale organic farm), Moestuinman (entrepreneur working with local food production) and Rotterdamse Oogst (farmers’ market aiming to shorten the link between local producers and consumers). These projects were selected based on their diverse food production practices and their contributions towards local food. Resilience of the projects were assessed using a four-dimensional framework of preparedness, persistence, transformability and adaptability. To understand where these urban initiatives stand with regards to these parameters, data was collected using a series of interviews and questionnaires for different actors and stakeholders. These stakeholders were divided into four groups, namely the municipal authorities, consumers, project owners/managers and local food producers. Perspectives of each these groups gave insights and better understanding of the power relation between the stakeholders that work for or against building resilient food projects. From the research, it was generally concluded that there were four important factors that influence the resilience characteristics of local food projects. Firstly, land tenure agreement and availability of the land, second, the demand for locally produced food, third, use of innovative methods to self-sustain and remain viable and lastly, ability of the initiatives to network and form alliances to mitigate potential crisis, financial and local food demand. All these factors are interlinked fundamentally, and the viability of any local food project requires all four stakeholders to work in a synergistic fashion. Since, the primary competitor of local food is cheaper produce from conventional farming practices available in supermarkets, it is important that local food prices remain competitive. The government and the municipal authorities can offer financial aids either in-kind or by offering tax subsidies to such projects. The consumers need to be given a choice of purchasing local food so that the demand for local food produce is sustained. Project owners and food producers can work towards teaming up with other initiatives to promote knowledge exchange and create a local. Finally, the governance mechanisms can work towards building the infrastructure for the local food system, making it more accessible while also considering the liveability of local producers. Local food projects tend to be more environmentally friendly and cannot replace conventional food production process. It is seen as an undertaking that compliments rather than competes with the traditional means of food production.